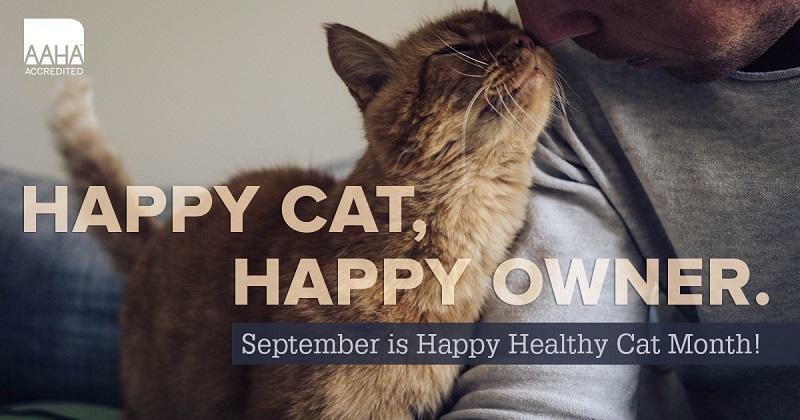 SEPTEMBER IS HAPPY HEALTHY CAT MONTH! WHAT CAN YOU DO TO ENSURE YOUR CAT IS HAPPY AND HEALTHY? Is there anything better than a cuddly cat purring peacefully in your lap? I would be hard pressed to find something. Cats are part of so many of our lives, it is only fitting that they get a whole month dedicated to their happiness and health! We know you love your cats as much as we do, so what can you do to ensure your best friends have a long, happy life? 1. Pay attention to the litter box. This is important on many levels. First, cats in general are very clean animals. A dirty litter box can be offensive to them and may lead to inappropriate bathroom habits. Be sure to scoop your cats’ boxes daily, preferably twice a day. Just think about not flushing your toilet for a couple of days, then scoop your cat’s litter box! Also, daily cleaning helps you determine what is normal. More urine clumps than usual could indicate a urinary tract infection or even systemic disease like kidney disease or diabetes. Diarrhea is also a cause for concern. 2. Cats need dental care as much as we do! Cats develop dental disease regularly, and some types of dental disease can only be diagnosed by close examination and x-rays under anesthesia. Diseased teeth are very painful, and many cats do not show how uncomfortable they are. However, if you’ve ever had a toothache, you can sympathize! Dental care is one area of preventative medicine that has been shown to extend your cat’s life by a matter of years. We know you want your cat around as long as possible- isn’t it nice to know you can influence that? 3. Watch that weight! Cats are by nature soft and squishy. This makes it easy to watch the pounds go on and think they are adorable. However, obesity can really take a toll on their health and can lead to systemic disease like diabetes as well as exacerbate orthopedic conditions like arthritis. And trust me, once the pounds go on, they are very hard to get back off. Healthy feeding from the onset is the key, and we have excellent dietary suggestions in case you have a cat that is a little extra “fluffy”. 4. Preventative care. Cats are often left out on some of the most important preventative care. It is easy to look at your cat and think “She looks great. She is eating, drinking, everything is fine”. I will tell you, cats are the ultimate pretenders when it comes to how they are feeling. It’s in their DNA to hide discomfort and disease until it’s too late to effectively do anything. For this reason, regular exams and periodic lab screening is critical to catch subtle changes before they get out of control. There is nothing I hate more than having to tell an owner that they will be losing their cat to a disease that I could have controlled if I had known sooner. You love your cats. We love your cats. We have made, and are continuing to make, changes to help make your cat’s vet visits less stressful for all involved. We don’t expect every cat to be happy to see us, but we are so happy when we can help you keep your feline family where they belong- feeling good with you. Have we seen your cat lately?